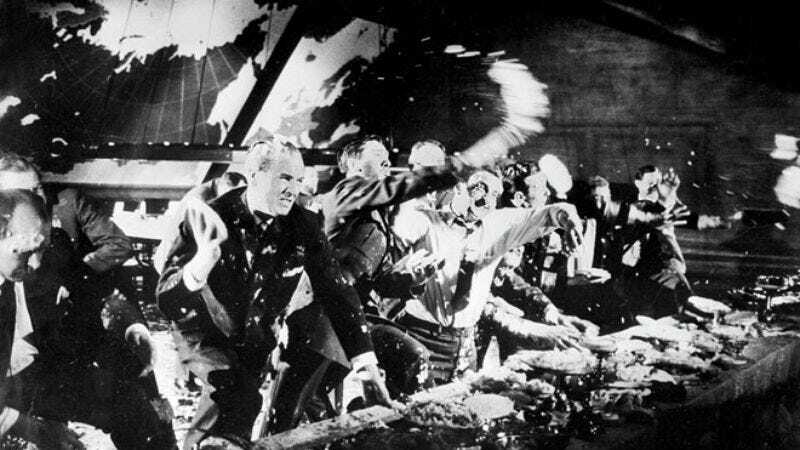 Alternate pie-throwing ending to Dr. Strangelove. The old pie-in-the-face prank, once brilliant, has slowly become a theatrical cliché over the past century. In recent years, it’s become common for community leaders to take one for the team to raise money for schools or charities. And pie-throwing has become a weapon, too—in 2011, a comedian threw a shaving-cream pie at media mogul Rupert Murdoch during a parliamentary hearing. But who threw the first pie? Who was the first target? Luckily, Hopes And Fears has compiled a history of the evolution of pie-throwing in comedy. From Mr. Flip in 1909 to the The Three Stooges, Looney Tunes, and Nickelodeon’s Pie Pod, they’ve got the whole messy, sticky story, complete, of course, with plenty of YouTube videos. If you want to see people get hit in the face with food in real life, check out “A Brief History Of Furious People Attacking Politicians With Food,” from Vice.